Confederate Lieutenant Iredell Jones, who observed the 54th’s fateful advance on Fort Wagner. In a Civil War mood lately because of current events. The above scene from the movie Glory (1989) never fails to move me. Courage is a precious virtue and the just never fail to honor it, even when displayed by foes. on August 31, 2017 at 5:30 am Comments Off on Give ’em Hell 54th! Any understanding of this nation has to be based, and I mean really based, on an understanding of the Civil War. I believe that firmly. It defined us. The Revolution did what it did. Our involvement in European wars, beginning with the First World War, did what it did. But the Civil War defined us as what we are and it opened us to being what we became, good and bad things. And it is very necessary, if you are going to understand the American character in the twentieth century, to learn about this enormous catastrophe of the mid-nineteenth century. It was the crossroads of our being, and it was a hell of a crossroads. An excellent brief retelling of the Civil War by the Civil War Trust using animated maps. The suffragette movement in the US cut across party lines and was regional in nation. The Western States were strongly in favor of votes for women, and by 1917 almost all states West of the Mississippi granted some form of the franchise to women, with most states in the area granting suffrage to women on the same basis with men. Illinois became the first state east of the Mississippi to grant women full voting rights in 1913. Every heart that has not been blinded and hardened by this terrible war must be touched by this moving appeal of His Holiness the Pope, must feel the dignity and force of the humane and generous motives which prompted it, and must fervently wish that we might take the path of peace he so persuasively points out. But it would be folly to take it if it does not in fact lead to the goal he proposes. Our response must be based upon the stern facts and upon nothing else. It is not a mere cessation of arms he desires; it is a stable and enduring peace. This agony must not be gone through with again, and it must be a matter of very sober judgment that will insure us against it. His Holiness in substance proposes that we return to the status quo ante bellum, and that then there be a general condonation, disarmament, and a concert of nations based upon an acceptance of the principle of arbitration; that by a similar concert freedom of the seas be established; and that the territorial claims of France and Italy, the perplexing problems of the Balkan States, and the restitution of Poland be left to such conciliatory adjustments as may be possible in the new temper of such a peace, due regard being paid to the aspirations of the peoples whose political fortunes and affiliations will be involved. The great lesson of the Civil War is that we are one people, North and South, black and white, and when I study that period in our history I always attempt to remember that fact. 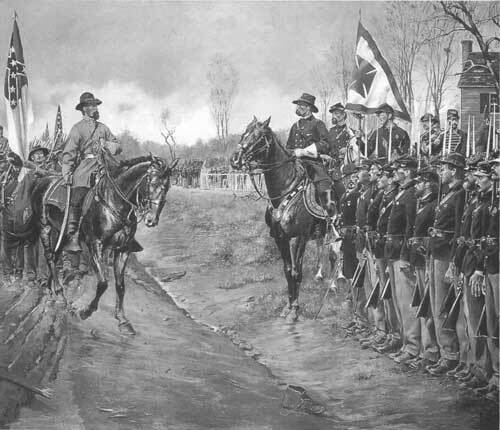 The choice of the two officers to oversee the surrender ceremony at Appomattox, Union General Joshua Lawrence Chamberlain and Confederate General John Brown Gordon, was quite appropriate. In a War where the vast majority of soldiers were volunteers and not regular soldiers, both these Generals were volunteers, not professional soldiers. They both during the War saw more combat than most professional soldiers see in an entire career. After the War both became active in politics and both often spoke of the need for love of the reunited nation and a forgetting of the angry passions of the Civil War, while ever remembering the courage of the men who had fought it, especially the courage of those who never came back from the War. of the Birth of General Robert E. Lee. memories of the valiant feats, alike of those who served under Grant and of those who served under Lee, precious to all good Americans. General Lee has left us the memory, not merely of his extraordinary skill as a general, his dauntless courage and high leadership in campaign and battle, but also of that serene greatness of soul characteristic of those who most readily recognize the obligations of civic duty. Once the war was over he instantly under took the task of healing and binding up the wounds of his countrymen, in the true spirit of those who feel malice toward none and charity toward all; in that spirit which from the throes of the Civil War brought forth the real and indissoluble Union of to-day. It was eminently fitting that this great man, this war-worn veteran of a mighty struggle, who, at its close, simply and quietly undertook his duty as a plain, every-day citizen, bent only upon helping his people in the paths of peace and tranquillity, should turn his attention toward educational work; toward bringing up in fit fashion theyounger generation, the sons of those who had proved their faith by their endeavor in the heroicdays. Washington College, a little institution in Lexington, Va., which had grown out of a modest foundation known as Liberty Hall Academy. Washington had endowed this academy with one hundred shares of stock that had been given to him by the State of Virginia, which he had accepted only on condition that he might with them endow some educational institution. To the institution which Washington helped to found in such a spirit, Lee, in the same fine spirit, gave his services. He accepted the position of president at a salary of $1,500 a year, inorder, as he stated, that he might do some good to the youth of the South. He applied himself to his new work with the same singleness of mind which he had shown in leading the Army of Northern Virginia. All the time by word and deed he was striving for the restoration of real peace, of real harmony, never uttering a word of bitterness nor allowing a word of bitterness uttered in his presence to go unchecked. From the close of the war to the time of his death all his great powers were devoted to two objects: to the reconciliation of all his countrymen with one another, and to fitting the youth of the South for the duties of a lofty and broad-minded citizenship. country, to commemorate his life and deeds by the establishment, at some great representative educational institution of the South, of a permanent memorial, that will serve the youth of the comingyears, as he, in the closing years of his life, served those who so sorely needed what he so freely gave. “Before we speak of justice for others it behooves us to do justice within our own household. Within the week there has been an appalling outbreak of savagery in a race riot in East Saint Louis, a race riot for which, as far as we can see, there was no real provocation, and which, whether there was provocation of not, was waged with such an excess of appalling brutality as to leave a stain on the American name. Today, August 21, 2017, the US will experience a total solar eclipse that will go across the continental United States, from the Pacific to the Atlantic. The last time this occurred was on June 8, 1918, proceeding from Washington State across the US to Florida. The press gave heavy coverage to the eclipse and rightly warned of the risk of blindness by looking at the eclipse with the naked eye. I would note that my son’s alma mater, SIU, is in the path of totality of the current eclipse and is running several events today. Go here to read about it.